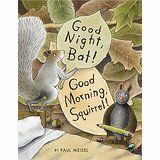 A great choice for early readers that will have wide appeal and could be read individually or with a group. Recommended for general purchase. The perfect introduction to the life cycle of the praying mantis for those ready to handle a mantid-eat-mantid world. Good Night, Bat! Good Morning, Squirrel! A fresh, funny, sweet offering in which friendship triumphs despite obvious outward differences. A must-have for any library.